So what happens to the adult teeth when a baby tooth falls out early? The adult tooth will just come in won’t it? Well, one of the major reasons for preserving baby teeth is that they guide the adult teeth into their proper place. When a baby tooth is lost early drifting (moving) of the surrounding baby and adult teeth is common. This could cause that ‘proper place’ to be crowded leaving little space for the new adult tooth to come in. So what do we do? It’s spacer time! There are many types and styles of spacers that we use at Alligator Dental. Our most common spacer is one that is fast and convenient. It can be made in one visit and be customized to the missing space. It consists of two parts: the ring and the loop. 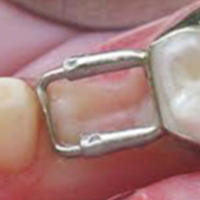 The spacer will hold surrounding teeth in place so the adult tooth can successfully grow in. The best part is that with the dental cement on them it looks like a little snowman.